Single-seat single-engined high-wing monoplane with conventional three-axis control. Wing has unswept leading and trailing edges, and constant chord; V-tail. Pitch/yaw control by elevon; roll control by 13% -span spoilerons; controls inputs through stick for pitch/ roll and pedals for yaw. Wing braced from above by struts and cables, from below by cables; wing profile Clark Y; 100% double-surface. Undercarriage has three wheels in taildragger formation; steel-spring suspension all wheels. Push-right go-right tailwheel steering connected to yaw control. Optional brakes on main wheels. Aluminium-tube framework, with optional pod. Engine mounted below wing driving pusher propeller. Aluminium to 6061T grade. Hummer Sales basic function was to assemble and sell the Maxair Sports Hummer in Britain. 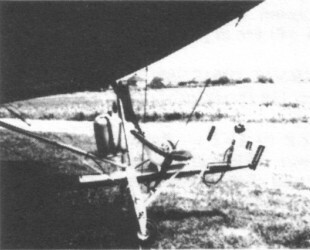 However, recognising the interest in conventional three-axis control in the UK, the company developed its own version of the aircraft, fitted with stick-operated spoilerons. Pedals operated the elevons individually, as well as the steerable tailwheel, while the fore-and-aft movement of the stick operated both elevons together. The Hummer TX, as this conventional three-axis control machine is known, should not be confused with the American three-axis version of the Hummer, which has its spoilers operated by the rudder pedals. Introduced in mid 1982, the Hummer TX uses a Robin engine, like most UK-built Hummers. In 330 cc guise (the basic model was 250 cc) the TX was regarded as a competitor to the Huntair Pathfinder, but in fact it was never seriously marketed. In April 1983 Hummer Sales decided to abandon aircraft manufacture altogether. Five TXs were built - three with 250 cc engines, one with a 330 and one without engine. Total spoileron area 2.3 sq.ft, 0.22 sq.m. Engine: Robin EC25PS or EC34PM.